1. It uses very little power and generates no heat. You can run it off solar or batteries as well as mains and put it just about anywhere. It does not come with a hard drive, but instead you install an Operating System onto an SD card. So you can have a selection of cards with different systems on to switch between – you just switch off the machine and switch the card over. I have cards to run it on Android, several flavours of Linux, RISCOS and several other embedded systems. The only annoyance I found was that I would like to run Ubuntu on it – but the hardware is not supported. But it is not just the ‘hobby’ market who have become excited about it. At the recent JavaOne conference, the Keynote featured Mark Reinhold (the man ‘in charge’ of Java), booting up Java on a Raspberry Pi. I will be setting mine up to run Java and will post some updates on our blog. 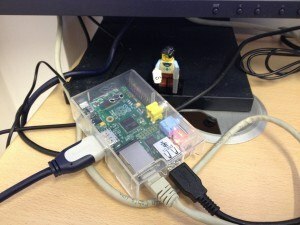 What are you using your Pi for?? ?